Inventory We are a resale marketplace, not a box office or venue. Ticket prices may exceed face value. This site is not owned by SaskTel Centre . SaskTel Centre, formerly known as Saskatchewan Place or SaskPlace and also the Credit Union Centre, is an arena located in Saskatoon, Saskatchewan, Canada. Situated near the city's northern entrance, the facility opened in February, 1988 with a seating capacity of around 7,800. It was expanded to 11,330 for the World Junior Hockey Championships in 1990. More additional permanent seating was added in 2008 and 2009. It currently can seat around 15,000 for hockey games and 13,000 for concerts. 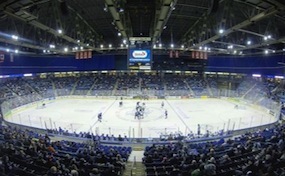 It is the home venue of the Saskatoon Blades hockey team. CentreSaskatoon.com is not affiliated with any primary box office or supplier. We are a privately owned and operated business specializing in sales in the secondary market. To buy tickets for any SaskTel Centre events in Saskatoon simply click on the event of interest or call our operators at anytime.